I took a day off the computer yesterday and just read books 2 through 5 of the Percy Jackson series. I have to say it was the best day ever! This is a really wonderful series with wide appeal both in age and in gender and the range is ages 8-adult. There is also no weak link in the series and every book stands on it’s own, though I do suggest reading them in order. I’ve included my previous book review of the first book, The Lightening Thief, below, and can add that I stayed up way past my bedtime, AGAIN, to finish the last book. They Are Simply That Good! 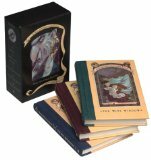 I’ve added the classic Mythology by Edith Hamilton which I read and loved as a child. You may as well capitalize on an interest in Greek Mythology and even Roman Mythology that this series will instill in your child. The Usborne is great for younger readers but Edith Hamilton is THE expert and her Mythology book has greater detail. I also wanted to add that I bought the 5 book set listed below; the one that looks like it’s in a treasure box. It’s $52 but the books are all hard cover, so I feel like it’s a bargain. Also, I never found any of the Percy Jackson books sitting on the library shelves and I was too lazy to reserve so it was easier to just buy the set. My 4th grader was just as excited as I was to open the box, and she abandoned Harry Potter, Book 6, to dive right in. She also LOVED them which was very gratifying to me. I do feel that I’ll get good use out of the books as I’m quite confident all my kids will go through this series at some point and LOVE IT! Grace Lin is the children’s literature version of Amy Tan. Her latest book, Where the Mountain Meets the Moon is her best yet. She weaves Chinese folk tales into a tapestry of stories where the whole is much greater than the sum of its parts. There is always a sweetness and innocence to her writing; there are always loving parents and children learning to believe in themselves and their culture. This could be Grace Lin’s own story. A RISD (Rhode Island School of Design) graduate, she dreamed as a child to become a children’s author and illustrator. And, it turns out, she did this with her best friend from childhood…the one who moves away to California just like her book The Year of the Rat. Where the Mountain Meets the Moon is an Asian-American version of the Percy Jackson series starting with The Lightening Thief. Where Riordan weaves in Greek Mythology into his plot, Grace Lin uses Chinese Folk Tales into a wonderful, inspiring and heart-warming story that teaches all of us to just… BELIEVE. My kids’ friends in 5th grade all voted this book the best book they’ve read this year. It is age appropriate for 8-12-year-olds, but frankly I enjoyed it too. Grace LIn gives a wonderful bibliography of Chinese Folk Tales that she used in the writing of the tale. She has beautifully illustrated this book to resemble Chinese paper cut-out art mixed in with 4 color paintings. I’ll be shocked and surprised if she doesn’t win a slew of awards for this book! If you are interested in a book discussion comparing Where the Mountain Meets the Moon to The Lightening Thief, I came up with some open-ended questions. Some might require outside research. 1) How old are the Chinese Folk Tales approximately? How old are the Greek Myths? 2) Do you see any similarities in any of the stories? Why do you think there might be similar stories? 3) What causes rain? How do Chinese Folk Tales explain rain? How about Greek Mythology? Why do you think they have these stories? What makes rain so important to the ancient Chinese? ancient Greeks? 4) What causes death? How do Chinese Folk Tales explain death? How about Greek Mythology? Which story do you like better? 5) Do we have any myths or beliefs that we can portent the future? What about fortune tellers or psychics? Who do you go to in Chinese Folk Tales to get your future told? How about in Greek Mythology? Why is knowing the future so important to people? Are we so different than ancient Greeks or ancient Chinese? Once your child can read Harry Potter, the entire universe of books opens up, but what is age appropriate? I have handed my oldest books that were Newbery Award winners, on the thin side, and with decent size type only to find them a tad too old for her based on content. I have a tendency to steer what I call “Grapes of Wrath” realism to middle school; I think these books are fine for 4th or 5th grade as a classroom assignment because the teacher provides context, but reading for pleasure should be … a pleasure. Another reason why some of these books are on this list is that, as historical novels, it will be a much richer experience to read them while learning about that period of time in history class. But, as always, it’s just a personal call. I have used the Boston Public Library’s book list as a guide. As always, if you want to purchase a book, just click on the image and you will be transported to Amazon.com. My original list was quite sparse simply because I’m backlogged with books for grades 3-5. In a testimony to the power of texting, my Mother’s Helper Extraordinaire (and straight A student) texted her Straight A Student Friends for help compiling: 20 Books I have Read in Middle School and Enjoyed. She said that she was shocked to get the list completed in 10 minutes. I will read these books eventually, but they have MHE after it to indicate it’s a recommendation from my 8th grader Mother’s Helper Extraordinaire (MHE). And who knew we read some of the same adult books?! Tuck Everlasting by Natalie Babbitt. MHE. The Boy in the Striped Pajamas by John Boyne. MHE. Deception Point by Dan Brown. MHE. The Tequila Worm by Viola Canales. Walk Two Moons by Sharon Creen. MHE. No Small Thing by Natale Ghent. MHE. Piper by Natalie Ghent. MHE. A Raisin in the Sun by Lorraine Hansberry. MHE. Can You Keep a Secret? by Sophie Kinsella. MHE. I did read this book also, and I thought it was a cute love story from the author of the Shopaholic Series. I personally wouldn’t have guessed that an middle-schooler would like this because I think of this as Chick Lit. But, to my earlier point, there is not a line between young adult and adult fiction, truly. This is an enjoyable read on the beach. I probably would not hand this book to my 8th grader but if she found it on her own I wouldn’t stop her. MHE’s friends also recommended Remember Me? also by Sophie Kinsella. I have to say I bought this book to read on a long plane ride and gave up. It’s not as interesting a story so I’m giving a fair warning. The View from Saturday by E. L. Konisburg. This might be Konisburg’s finest work, which is saying a lot given her two Newbery Medals! This tightly woven story tells the story of four members of Mrs. Oliniski’s 6th grade Academic Bowl team and their unlikely state middle school championship, but also weaves together short story about each of the students reminding us that there is only two degrees of separation between kindness and love. The Giver by Lois Lowry. MHE. Every Soul a Star by Wendy Mass. MHE. The Hunt for Atlantis by Andy McDermott. MHE. The Host by Stephenie Meyer. MHE. Maximum Ride series by James Patterson. MHE. Holes by Louis Sachar. The Boston Public Library places this book under Middle School, but it’s also worked successfully as a book club book for boys in 3rd grade. The Mysterious Benedict Society series by Trenton Lee Stewert. MHE. The Land by Mildred D. Taylor. MHE. Uglies series by Scott Westerfeld. MHE. The Book Thief by Marcus Zusak. The moms in my book club swooned over this book. They were reading it for their mother/daughter book club and highly recommended this book. We almost picked it for our adult book club.